Come sostenere bambini profughi e migranti verso un’ integrazione scolastica di successo in Europa? The purpose of the study was to identify the existing needs in the field of migration for teachers and pupils in several countries of the EU so as to render a more successful school career for pupils with and without migration background. On the one hand, the concrete aim was to develop and provide modules for a teacher training course, which focused on cultivating the civic-cross-cultural competences of teachers in Europe’s elementary schools. On the other hand, it aimed at developing and distributing learning Material for elementary school pupils at various levels, centred on the subjects of human flight, migration, social justice and interculturality. The overarching goal of the project is to enable pupils having a so-called “migration background” to enjoy a successful school career, making their chances and opportunities better than what they would have been in past years. Along with this analysis report, five reports were completed describing the situation of immigrants in Malta, Italy, Slovenia, Hungary, and Germany. There is also a report available on the efforts of the EU to develop a Common European Asylum resp. Immigration System. The consortium pursues two main objects: On the one hand, the training of political-cross- cultural competences of primary school teachers, and on the other hand the development of teaching material for primary school pupils on the subject of migration, refugees and diversity. The teachers training course includes a module for self-reflection on one’s own norms and values, as well as defining one’s own position of power in society. In the study “Migrants, Minorities and Education” it emerged that teachers displayed subconscious discrimination towards children with a migration background. This in turn leads to a decrease in the motivation to learn on behalf of the pupils. The Anti-Bias Approach can result in bringing this behaviour to light. This approach embraces not only the individual attitudes but that of the different structures of society. This means for example, that the participants look into the question of: How does the school’s administration and processes contribute towards the possible discrimination of its pupils? Taking into account the various levels where discrimination can take place is hereby an innovative approach of the MIRACLE training, when compared with other courses dealing with intercultural issues. During the MIRACLE project, a general challenge was to prevent prejudice and stereotyping. When immigrant students and adults are depicted, it is always combined with the aim to campaign against stereotypical images. The consortium has focused on the development of critical thinking, instead of working with approaches that can easily lead to a narrow cultural mindset or respectively, cultural racism. In this respect, exercises in classes and at school events based on typical traits which can be culturally associated (“typical food” or “typical clothes”) are one step in this direction, especially if there should be no additional time planned in the exercise to differentiate specific results. The MIRACLE consortium is skeptical towards these kinds of exercises because many differences among people have other reasons than a cultural influence. There could be differences based on individual socialisation, economic background (social classes) or unequal education etc. Cultural racism is a phenomenon which declares that a social minority culture is not compatible with the host majority culture. It constructs a phoney hierarchy between the social groups and presumed, constructed cultural differences, which do not exist in reality. Culturalisation itself may become evident in every day school life when pupils are seen and treated as marionette puppets on prejudice-strings, which are held up by clichés of their alleged culture. For a detailed picture of the theoretical background of the consortiums assumptions on concepts like “culture”, “identity”, “racism” etc. please refer to the curriculum of the course. What do/did the student/children learn in terms of expected skills, competences and attitudes? The first unit of the MIRACLE Manual “Nothing is as it seems‟ aims to allow pupils to understand how stereotypes and prejudices develop. This is considered to be a crucial learning aim, or even a learning requirement, if pupils are to discuss and learn about subjects like migration and human flight. Sometimes even young children already have beliefs which reduce and devalue certain social groups or people with different cultural backgrounds from their own. The prejudices may be sustained by seemingly harmless games and counting rhymes (i.e. 10 little „Indians‟), through famous literature („Uncle Tomì’s cabin‟) or even through historical national characters, such as „Jim Crow‟ in the USA – a highly stereotyped black figure. One of the first topics of this manual is therefore the importance of dealing with one’s own prejudices, and those of pupils. Moreover, the next unit about migration focuses on the migration experiences of each pupil’s family – to allow children to understand that migration isn’t an exception, but rather normality. The last unit in this manual which handles the subject of migration is based on a literary book in which the main character is a young immigrant. It’s all about the challenges and problems which may arise when someone has to leave his/her home country and immigrates to a foreign country. In this unit on migration, different facets of immigration and emigration are covered. The last chapter focuses on the subjects of identity and language, as the second language plays a crucial role after immigrating to a foreign country. Along with other things, it is closely related to one’s sense of belonging and it is therefore regarded an important facet of personal identity. The two units „Me and my languages‟ and „Identity and ethnocentrism‟ aim at allowing pupils to become aware of the fact that they have a lot in common with their classmates and, at the same time, they may clearly differ from others. Therefore these units challenge certain tendencies of social homogenization, which not only occur on a political level, but also often in the field of education. Teachers may link the results of the lesson with a modern society, especially when specifically taking the dominant discourses on certain groups of people into consideration. Furthermore, “Me and my languages” and also “Languages in contact” promote the benefits of bi-and multilingualism, no matter which languages they are referring to. In doing so, pupils get the chance to also discuss possible hierarchies between a country’s languages. How to promote a culture of understanding and respect towards cultural diversity? During the MIRACLE project, a general challenge was to prevent prejudice and stereotyping. When immigrant students and adults are depicted, it is always combined with the aim to campaign against stereotypical images. The consortium has focused on the development of critical thinking, instead of working with approaches that can easily lead to a narrow cultural mindset or respectively, cultural racism. Does/did the study involve minorities representatives (families, communities, etc.)? In order for the project consortium to be as specific as possible in the needs of primary school teachers in the area of political-cross-cultural education, research was done into what exactly this group needs. Therefore research was carried out to find out what daily challenges the teachers face, and to clearly map out what supportive measures are needed by teachers, migrant and non-migrant pupils. Different approaches were chosen on a methodical level: teachers filled out a questionnaire. The compilation of the questionnaire was a joint effort of the project partners, which you can find on the website. 106 teachers from five European countries, who teach children between the ages of 5 and 14, took part in the survey. In addition, the project partners conducted 12 interviews in five countries with experts concerning the implementation of further training in the political-cross-cultural area. Furthermore, the curricula of all partner countries were analysed on a national and regional level. The results of all the national research are summarised in 29 pages by Judit Koppány in Comparative Report on the Impacts of Migration on the Educational Setting and the Possibilities that Guarantee Equal Educational Opportunities for Children with and without Migration Background. In all researched countries, it was immanent to the school systems, that deviating from the norm was seen more as a deficit and that made it clear that different pupils have different prospects. Moreover, it was obvious that the groups of children with a migration background were extremely heterogeneous regarding background and needs. These have to be permanently taken into account, when finding solutions for certain academic problems. The following were identified as fundamental challenges for teachers: the learning of the respective national language as an additional language for children with a migration background; the assessment of prior experience and knowledge, the pedagogical differentiation regarding the content of teaching and learning material, the communication between teachers and parents, the co-operation between majority and minority students, and the initiation of changes in the systematic level of the school. The results of the MIRACLE project, especially the modules and teaching units, could be tailor-made based on the detailed needs-analysis. What were the innovative aspects in the methods and techniques that have been used within the project? Taking into account the various levels where discrimination can take place is hereby an innovative approach of the MIRACLE training, when compared with other courses dealing with intercultural issues. Chapter 2 contains detailed descriptions of further modules. The participants of the training were introduced to additional approaches and material that make it easier to deal with a heterogeneous classroom. During the course, this aspect was covered through practical exercises. The approaches and material have been designed by teachers who to some extent have decades of experience in teaching heterogeneous groups. Pupils that come from socially disadvantaged backgrounds with various learning abilities are also included in this group. The MIRACLE project rests strongly on the so called Anti-discrimination policy that the European Union passed in 2000. The regulation 2000/43/EG is supposed to deter discrimination against “ethnical background” along with the regulation 2000/78/EG which is supposed to deter discrimination against religion, ideology, disability, age or sexual orientation. International reports on migration policy and on teacher trainings and needs in the field: interviews with experts, questionnaires, etc. 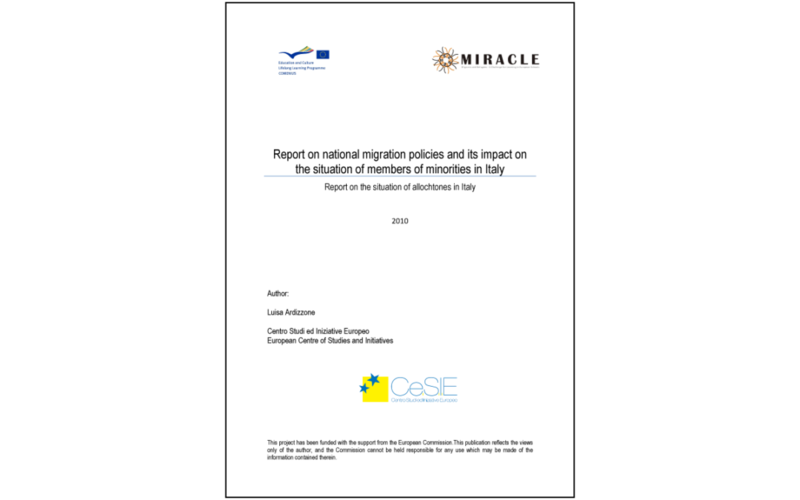 Report on National Migration Policies and its Impacts on the Situation of Members of Minorities in the Partner Countries. 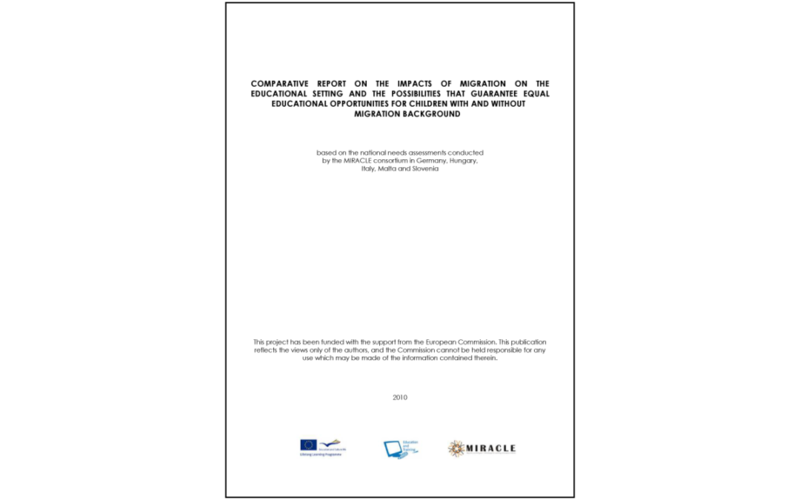 Comparative Report on the Impacts of Migration on the Educational Setting and the Possibilities that Guarantee Equal Educational Opportunities for Children with and without Migration Background (Summary of the National Findings). This teacher training course manual contains some of the teaching and learning units for 5 – 14 year old pupils, several will be applied during the course itself. However, all were developed according to the results of a comprehensive needs analysis.